But soon I found myself conflicted. Older boys hastened to rain on my parade. Homophobia was as normal at my school as wearing clothes. Nobody wanted to stand out for the wrong reasons. When I joined the senior school, I was the only kid in short trousers for a full day, a distinction which hung around my neck for the next seven years. I was desperate to blend in, and any hint of being less than 100% heterosexual would lead to ostracism and bullying. Liking Bowie or T.Rex was a risk. “He looks like a puff,” chorused my elders and betters. And Bowie’s (for the time, anyway) androgynous looks were accompanied by rumours of bi-sexuality. Yet these same boys were growing their hair as long as they could get away with, keeping out of the way when the barber made his monthly visits. For the most part, survival being the primary goal, it was better to stick with prog rock or good old rock’n’roll. Roger Daltrey, Robert Plant and Mick Jagger may have worn their hair long and their trousers tight but there was no mistaking their power and machismo. 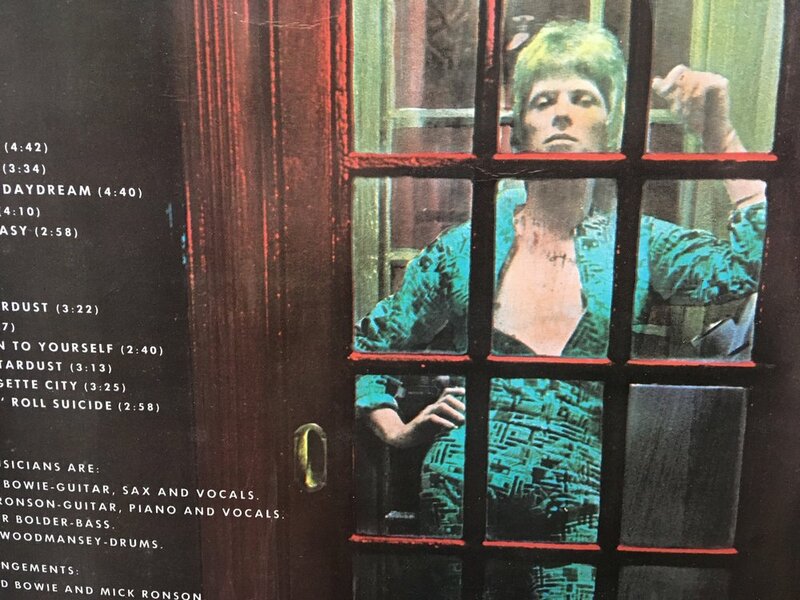 And when Diamond Dogs came out, with Bowie sprawled naked, albeit in a painting, across the cover, well… “You can see his balls!” Somehow the fact that his form had morphed into that of a dog by this point wasn’t enough to excuse this affront to decency. I stopped buying Bowie records until about 1980 when I found I had some catching up to do. What a waste! I had allowed peer pressure to dictate not just my taste in music but who I was allowed to be. The fact is that the people we all admire the most are those who have the courage to break the boundaries of what society considers acceptable. We don’t all have the courage, or even feel the need, to be outrageous but we can help shape public opinion. Simply by refusing to join in the chorus of opprobrium which greets anyone who dares to be different we are giving freedom, not just to these pioneers, but to ourselves as well.